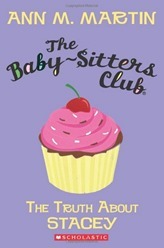 October 16, 2013 By Allyson 5 Comments This post may contain affiliate links. Read my disclosure policy. With the holidays right around the corner, I am trying to get a jump on all the holiday shopping. Luckily, I have Amazon Prime which allows me free shipping (on mostly anything), and other awesome perks as well such as free streaming of movies/tv shows (much like Netflix, but it’s included in the Prime membership)! Don’t worry if you don’t have Amazon Prime, I have a special offer for you! 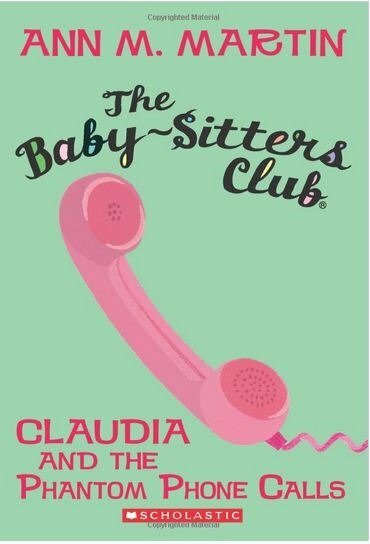 You can click here to sign up, and you will receive a 1 month membership for FREE (it must be the first time you have had a membership)! That means you can order all your holiday goodies, and if you decide you don’t like it for some reason, you aren’t obligated to continue with your membership! Don’t walk, run. Okay, back to holiday shopping! I’m going to do a 4 part series on what to buy for the people in your life. I’ll focus on the following categories: Babies & Kids, High school and College Students, Significant Others, and Parents & Grandparents. Amazon definitely has something for everyone. I will link the products to amazon where you can check their ratings, prices, and specifications. 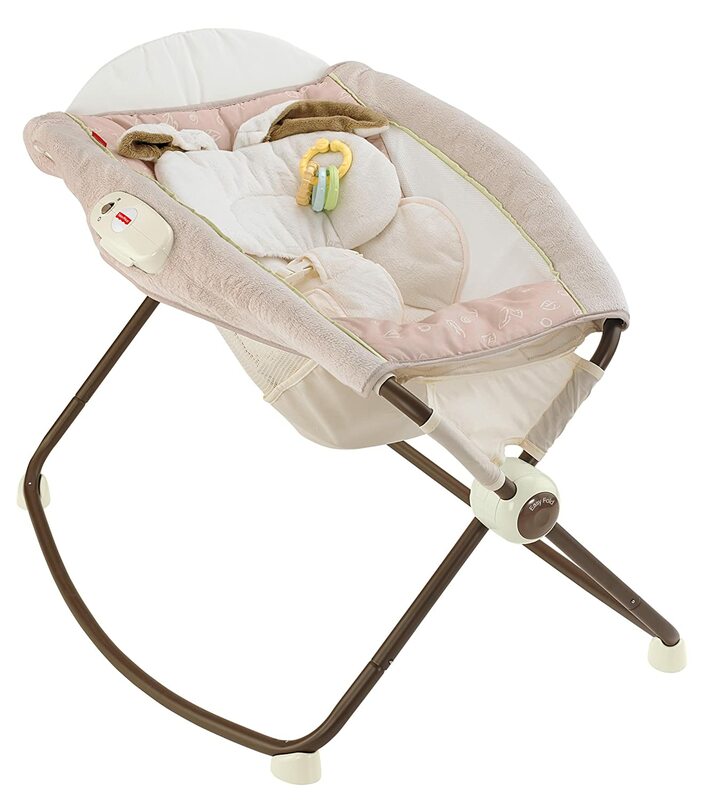 Fisher-Price Rock n’ Play Sleeper is the perfect gift for a baby or a mom that is expecting. This is seriously the most amazing baby item, and yes, you need it. I know over 300 moms who rave about this thing on a regular basis, and it was the ONLY thing my colicky/fussy/never sleeping son would actually sleep in! Have you heard of Sophie?! 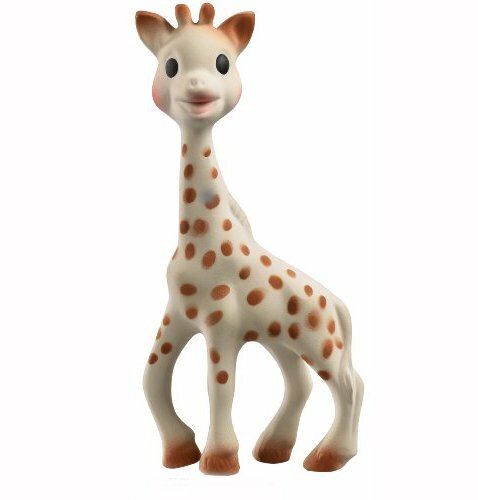 Well, if not, then you are missing out on the world’s best teething toy!This is not a normal giraffe, this is Sophie the Giraffe!! 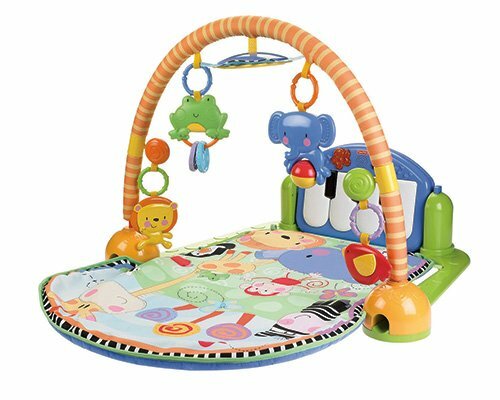 One of my friend’s has a 3 month old right now, and she swears the Fisher-Price Discover ‘n Grow Kick and Play Piano Gym is the best baby toy ever! She says she gets at least 30 minutes of playtime from it! It looks like everyone on Amazon loves it as well! 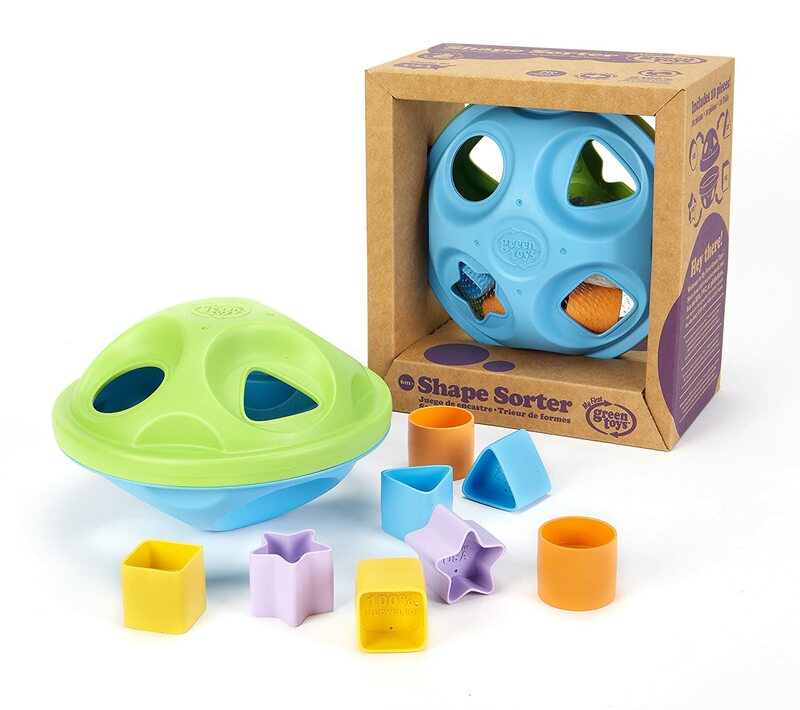 The Green Toys Shape Sorter Baby Toy is an awesome learning toy for little ones (about 6+ months). My son learned all this shaped and colors from a shape sorter, so they are definitely fun learning tools! 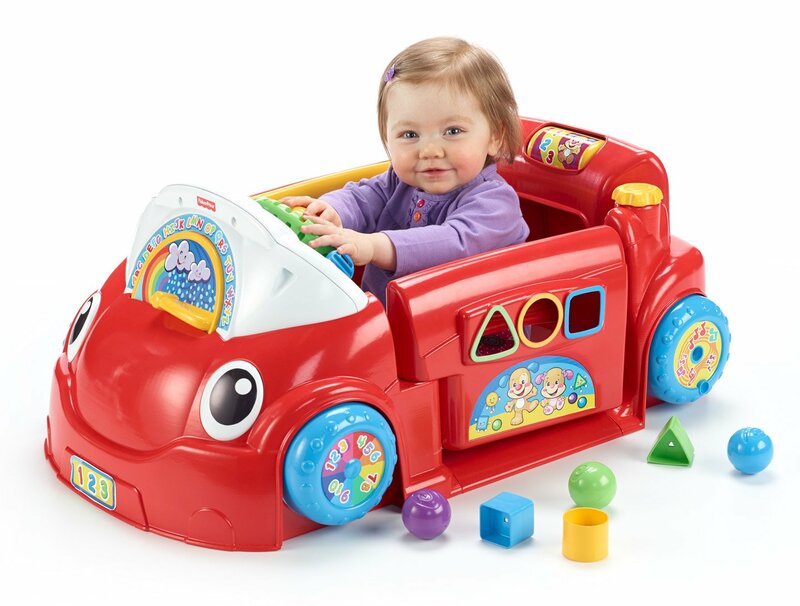 The Fisher-Price Laugh and Learn Crawl Around Car is fun for kids 6+ months. It also included a shape sorter and lots of big bright buttons for added fun and stimulation! 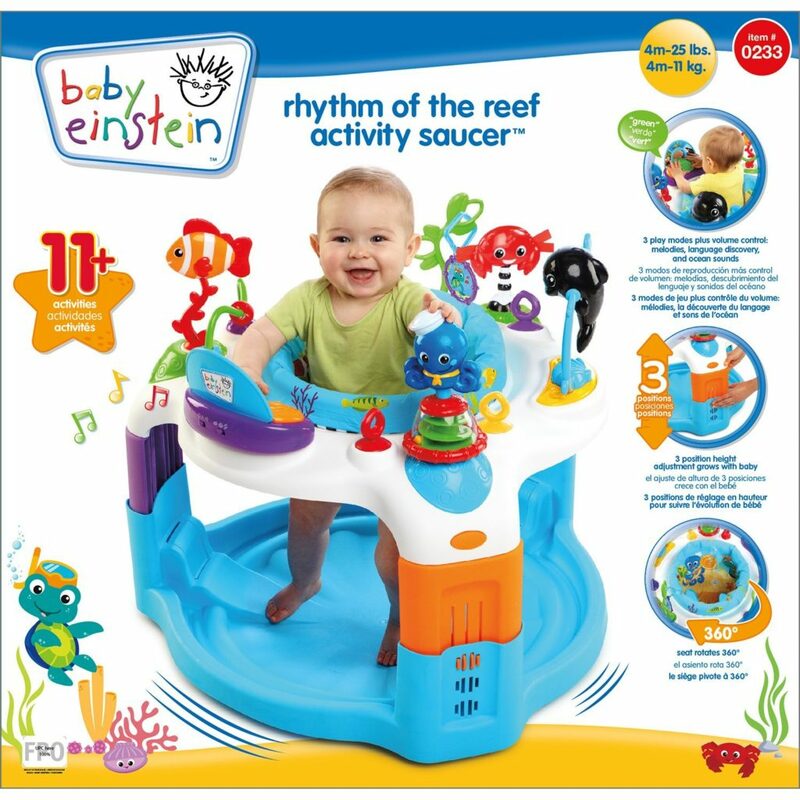 The Baby Einstein Rhythm of The Reef Activity Saucer is really great for kids who can support some of their weight, and want to play! They can jump around and play with all the hanging toys as well. 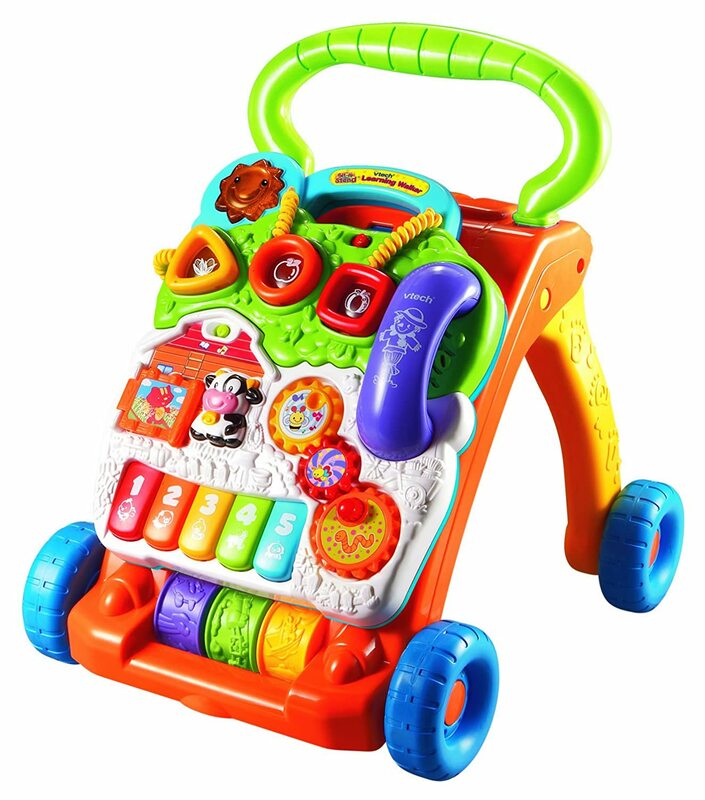 The VTech Sit-to-Stand Learning Walker is great for those babies who are pushing up and trying to walk. They will be cruising around in no time with this littler toy helper! 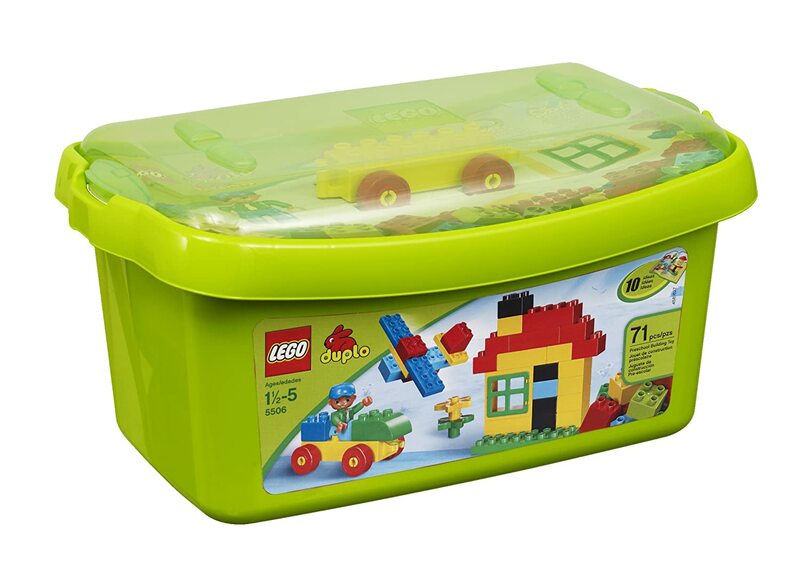 The LEGO Duplo Building Set is perfect for any toddler who is interested in building. 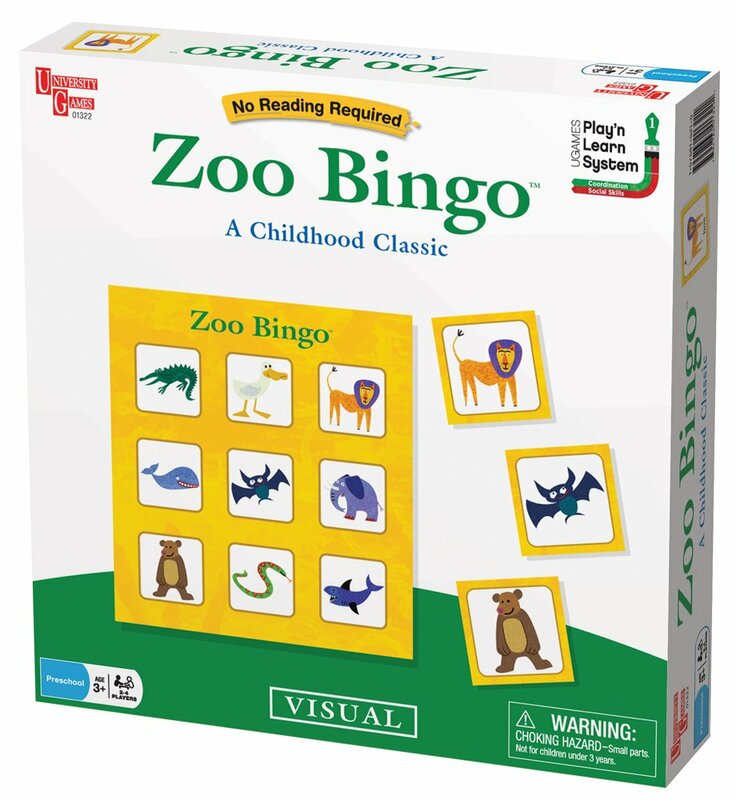 They are great beginner building blocks, and will have along life with a growing child. A VTech Go! Go! 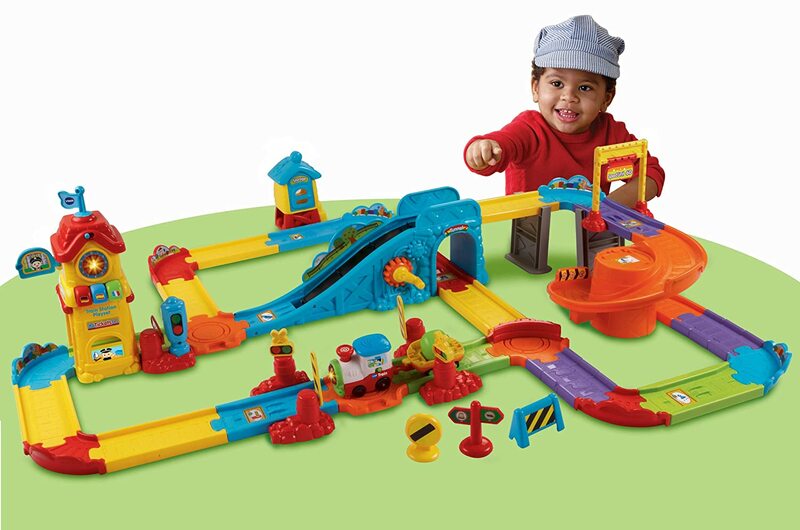 Smart Wheels – Train Station Playset is a really fun gift for kids over 1. As they grow this toy grows with them since they can change the track around into different configurations. Like most Toddlers, my son loves music. He especially likes all the Children’s Favorites . We bought this CD long ago and it’s almost totally worn out from so much repeated play. 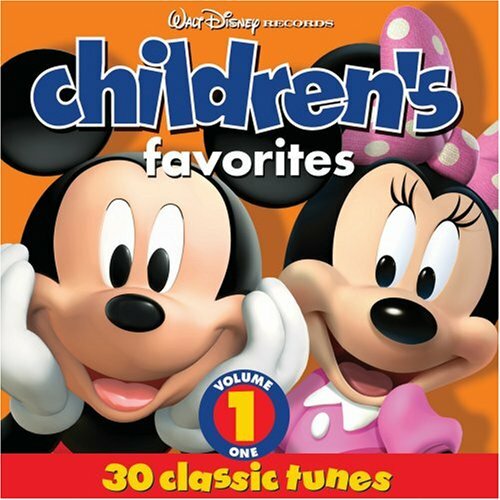 Any toddler would love this fun CD! 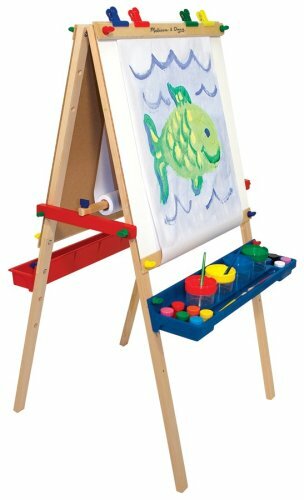 A Melissa & Doug Deluxe Standing Easel is a really functional toy. Toddlers can learn motor skills and get a sense for art at the same time. Many studies show that children who do art activities from a young age have an easier time with learning other things. Exposure to art is very important! 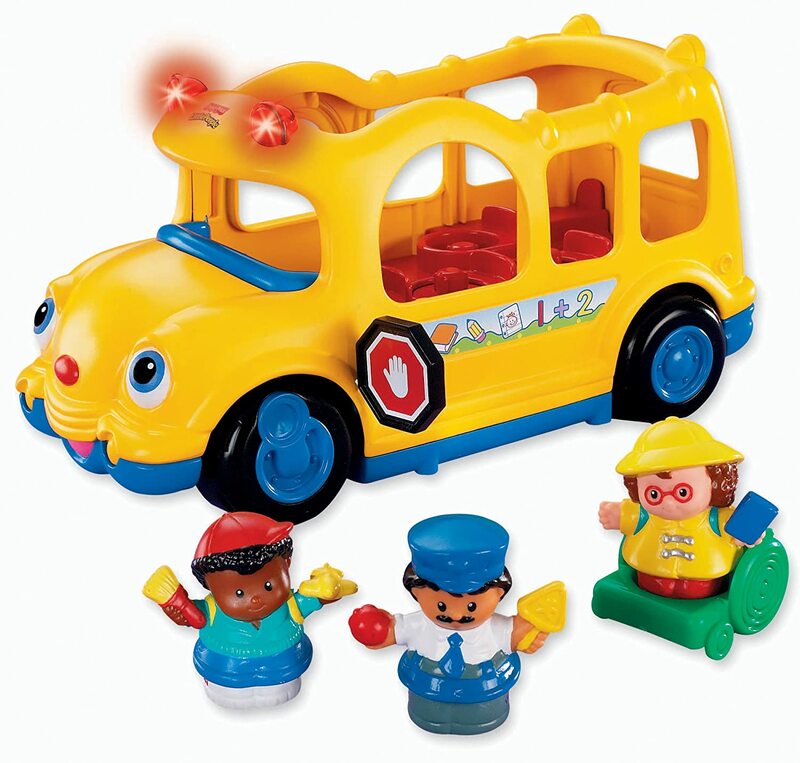 My son is 2.5 and he has been absolutely obsessed with this Fisher-Price Little People Lil’ Movers School Bus . Not only does he love the bus, but he loves the little people it comes with too. All kids I know this age are obsessed with trains! 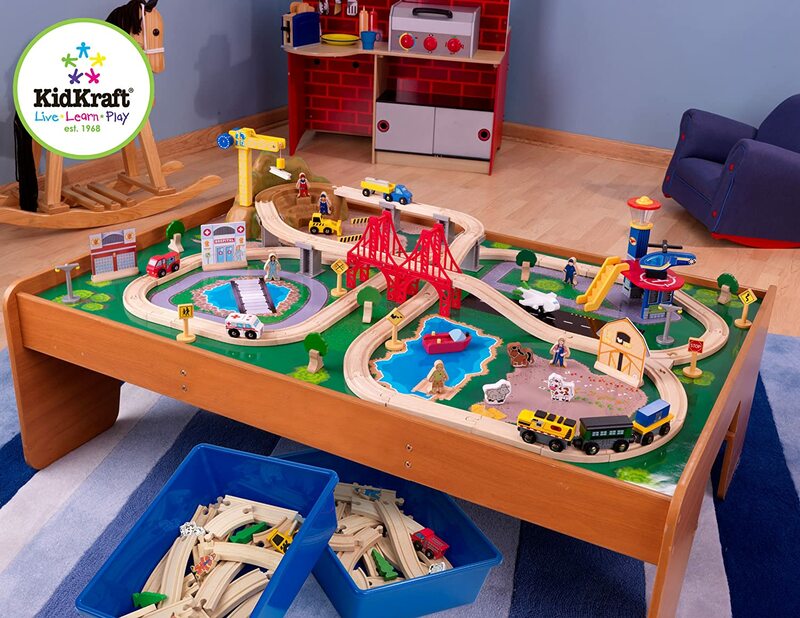 This KidKraft Ride Around Train Set and Table (with over 100 pieces!) would be the perfect big gift from Santa or Mom and Dad! While most girls I know love buses as well, who doesn’t love a little princess action? 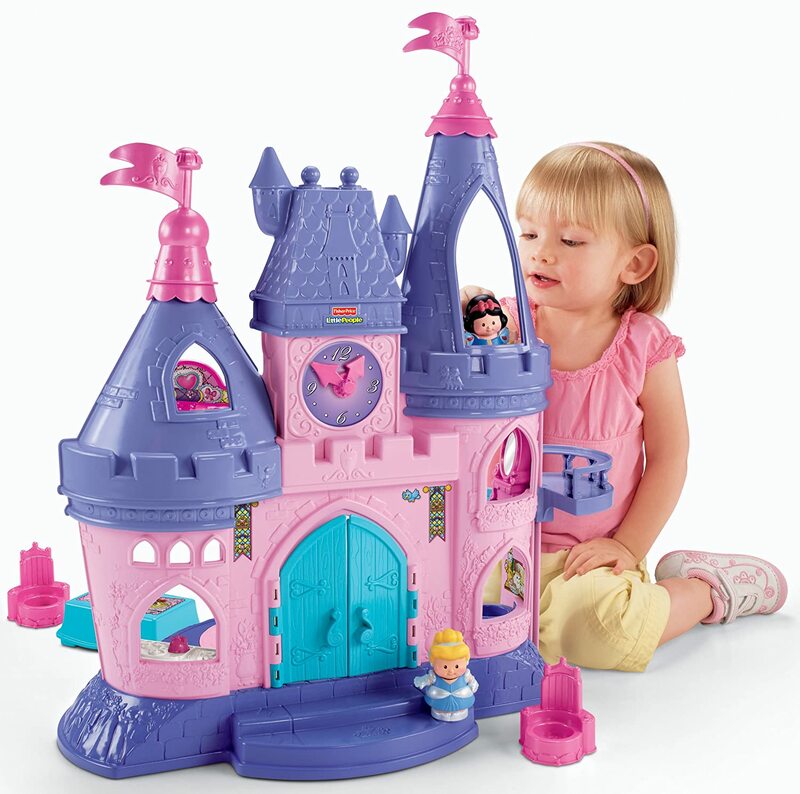 This Fisher-Price Little People Disney Princess Songs Palace is totally adorable and the little people work with other Little People toys as well! So cute! 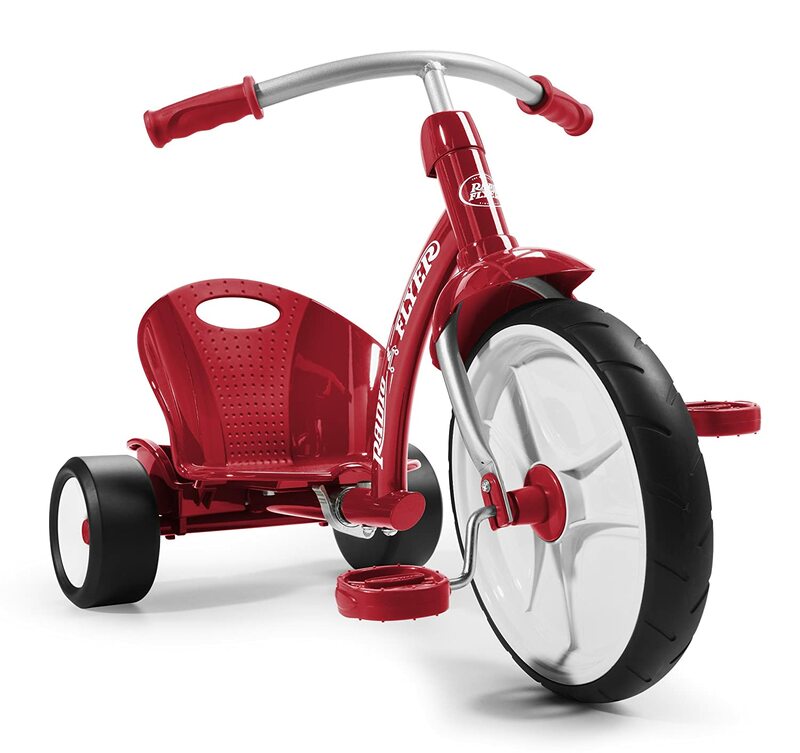 This Radio Flyer Grow ‘N Go Flyer tricycle is really great for kids about 2+. 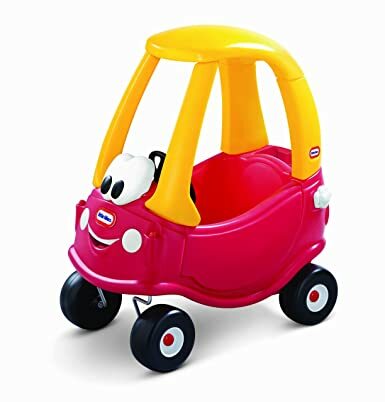 It actually expands so as your child grows, they won’t grow out of the trike! Kids around 3 years old really start loving to dress up and play pretend games. This Learning Resources Pretend & Play Doctor Set is a great way to expand their imaginations. 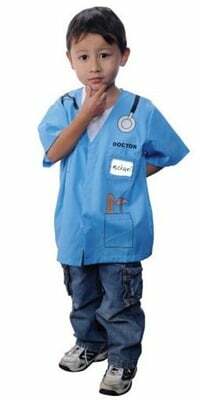 This Dr. Suit would be perfect to go along with the Dr. Kit above! 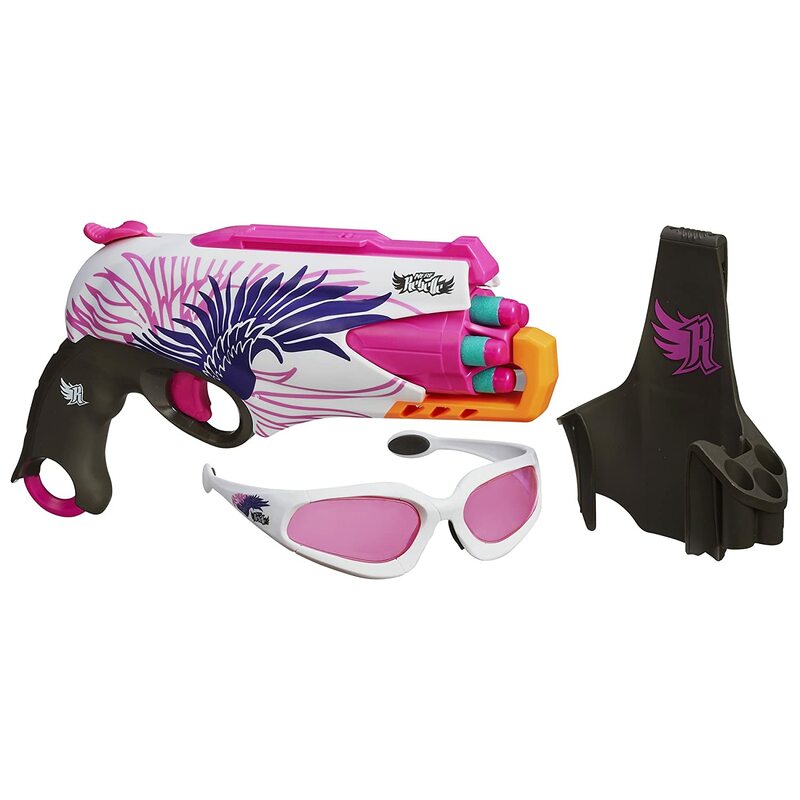 They have it in blue and pink! 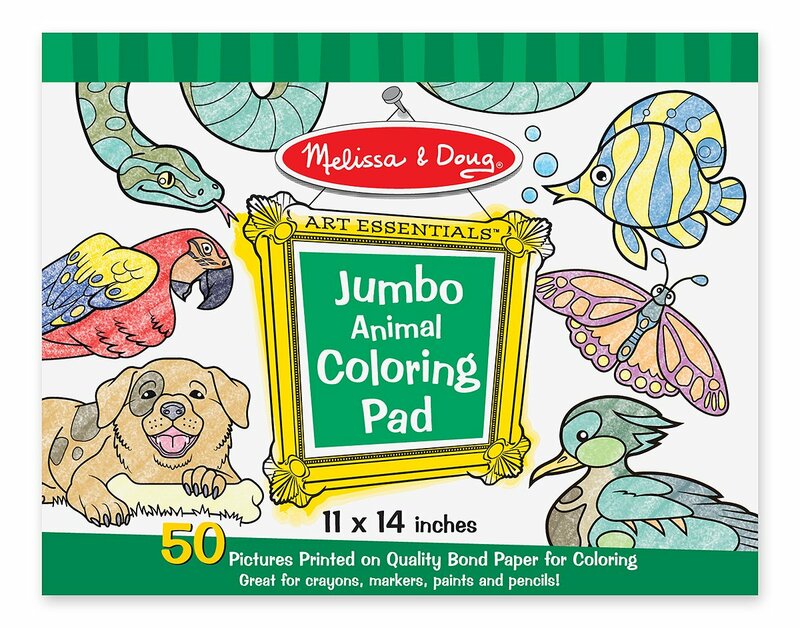 These Melissa & Doug Jumbo Coloring Pad are seriously so awesome! They have huge pictures, and kids can learn to color in the lines without a bunch of frustration! Pair this with a pack of Crayola 64 Ct Crayons and this is a perfect gift set! 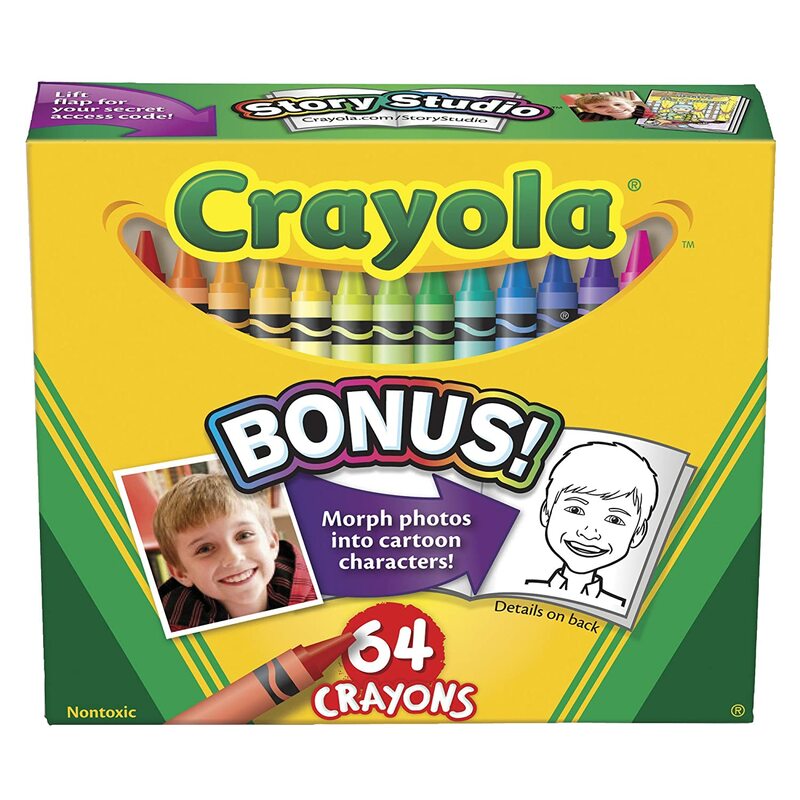 Have you seen these Crayola Color Wonder Markers ? They are awesome because they only work on the special paper they are intended for. 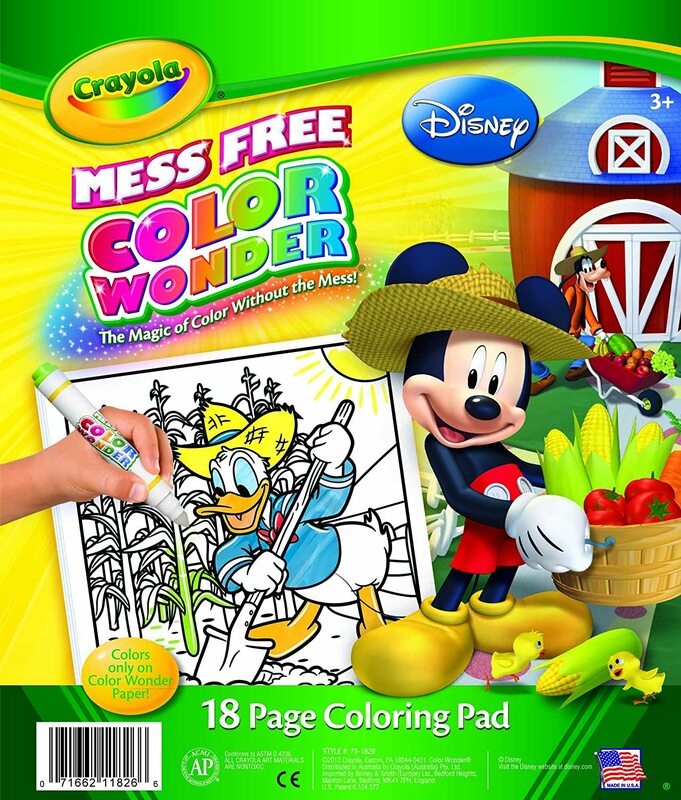 Pair with a special Crayola Color Wonder Disney Preschool Coloring Pad and you are good to go! 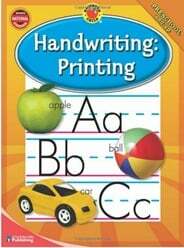 By this point your little one is probably anxious to start learning to write! 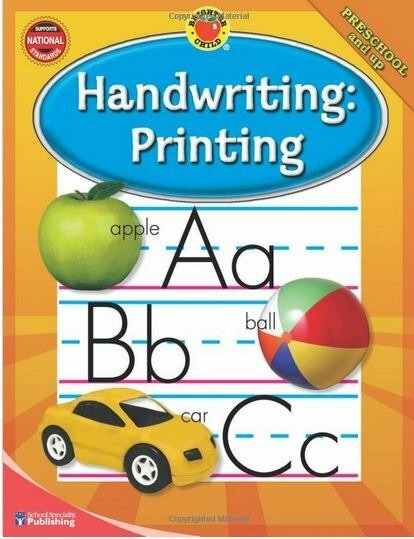 Dry erase books like this Handwriting Book are really helpful in learning to write letters. 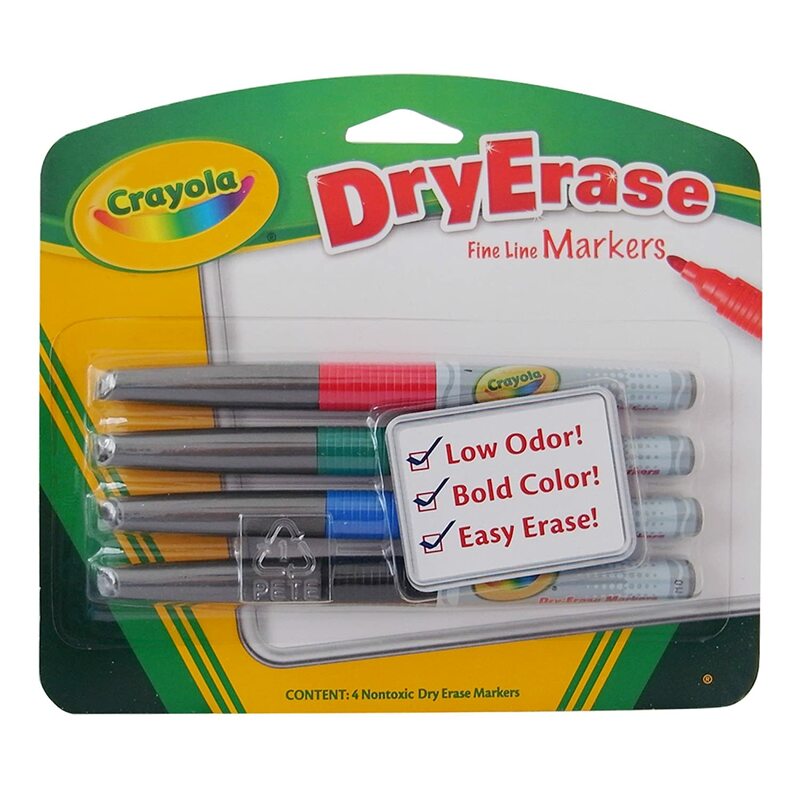 Grab some Fine Line Dry Erase Markers . 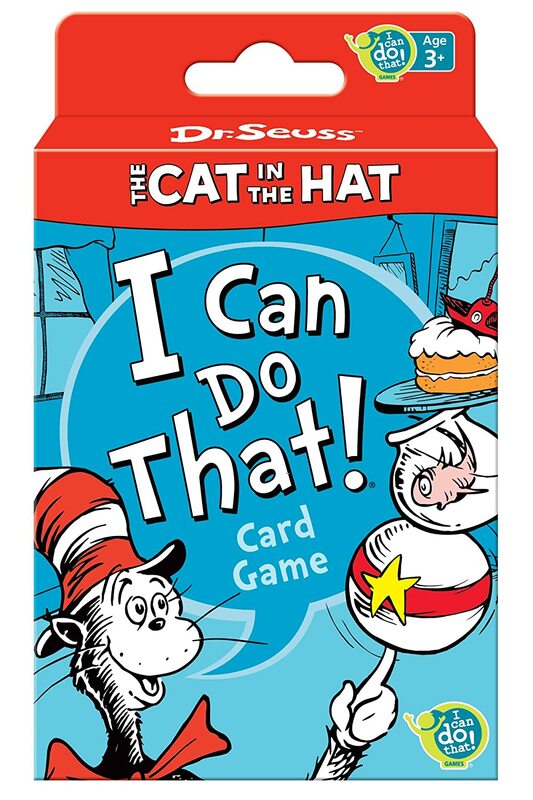 Preschool Zoo Bingo and Dr. Seuss Cat in the Hat Card Game are 2 great games for preschoolers! 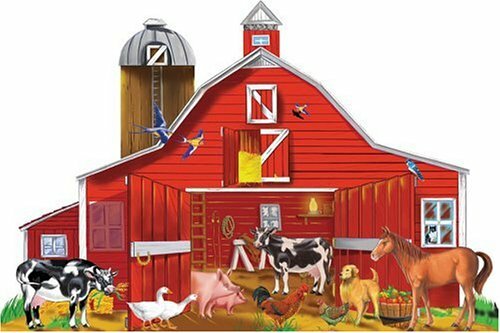 The Melissa & Doug Giant Fire Truck Floor Puzzle and Melissa & Doug Farm Friends 32 pc Floor Puzzle are tons of fun! 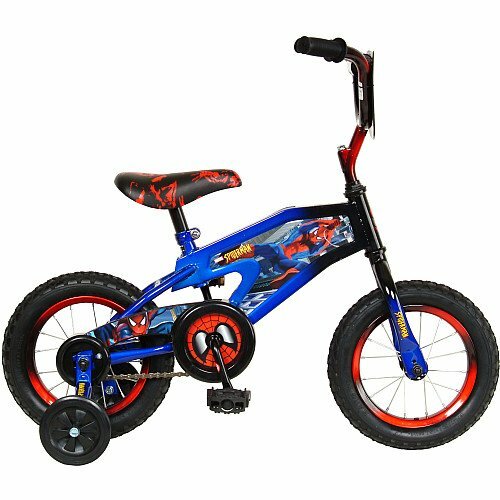 Around this age kid’s start wanting to have more independence and learn how to ride a ‘real bike’! 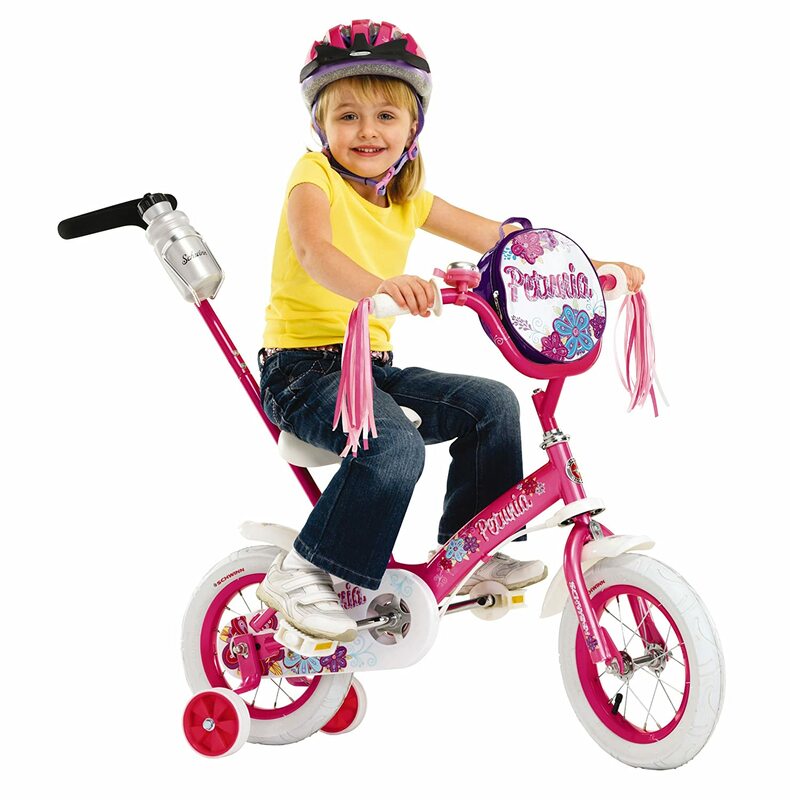 The Spiderman 12-Inch Kid’s Bicycle and the Schwinn Girls’ Petunia 12-inch Steerable Bike are great to learn with! Once they get the hang of it, the training wheels come off! 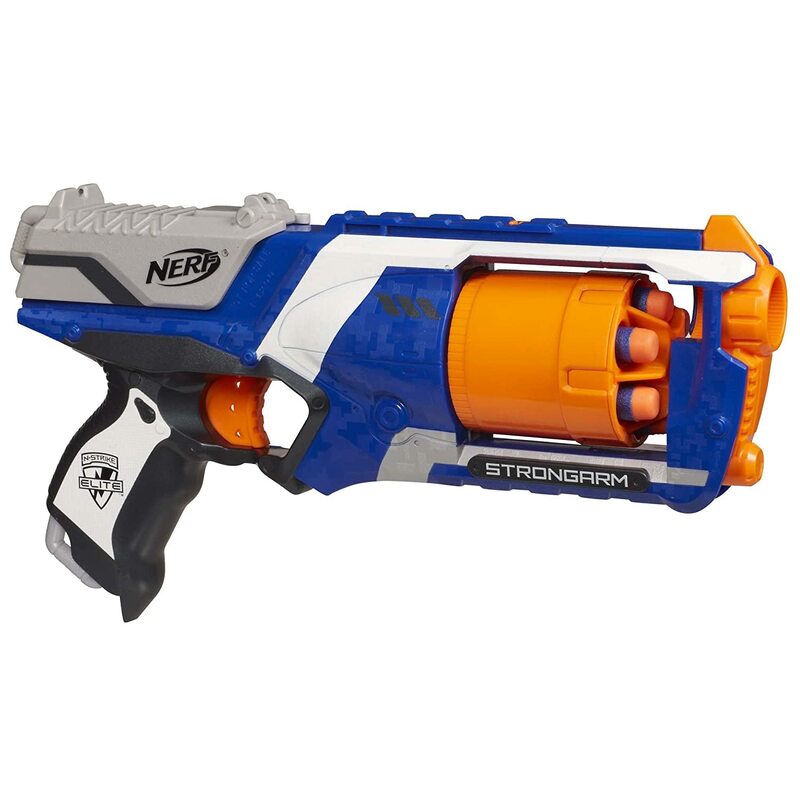 Nurf guns such as the Strongarm Blaster and Nerf Rebelle Sweet Revenge Dart Kit , are really popular with the boys this age. It’s great to take them outside and have them run around chasing each other! Legos are great for all aged 4+. 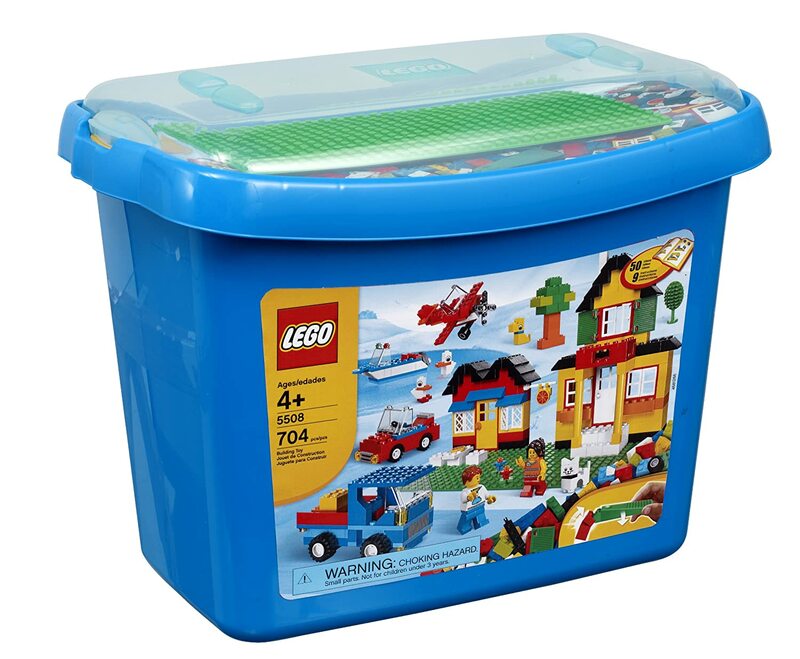 There are small parts so you don’t want to risk younger children playing with the smaller legos, but this LEGO Bricks & More Deluxe Brick Box (704 pieces) will last you forever! 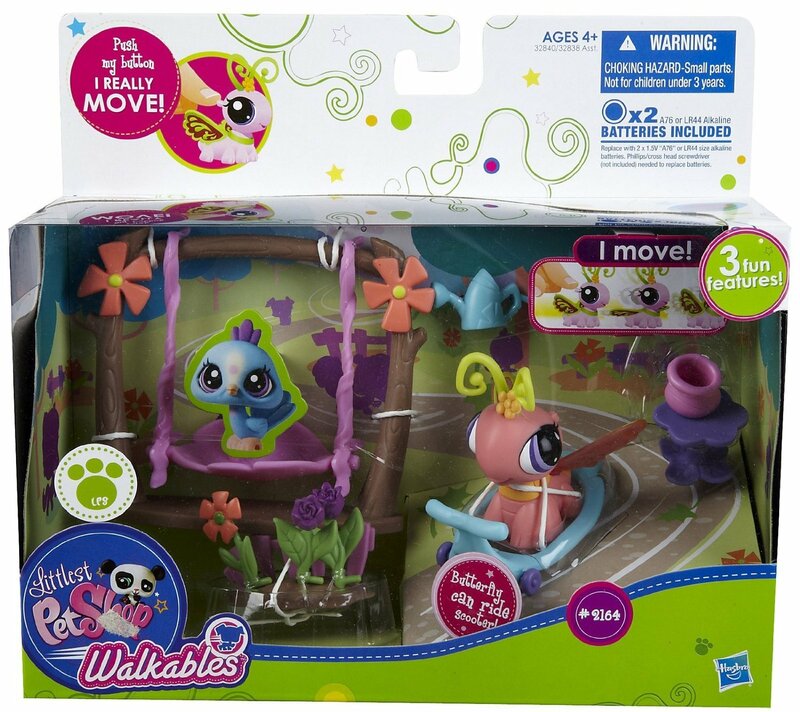 The Littlest Pet Shop has been popular with girls for years, and this Littlest Pet Shop Walking Pets Themed Pack is no exception! 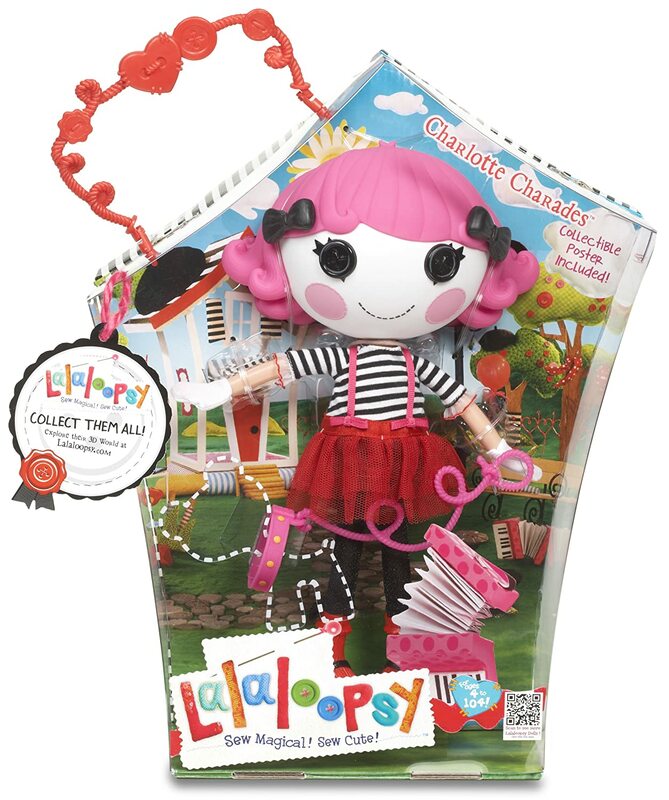 LaLaLoopsy Dolls are also super popular and have a long shelf life (girls 4-13 really love them!). 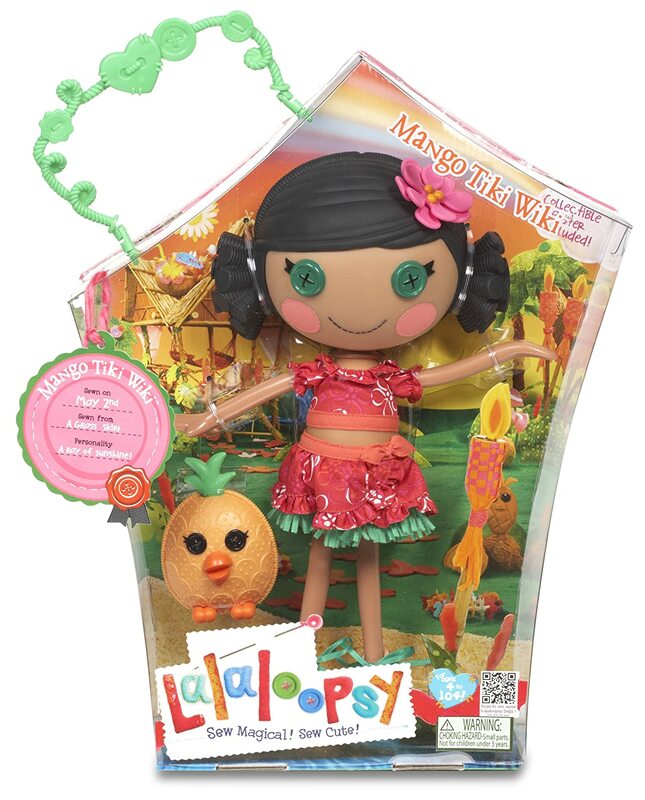 The Charlotte Charades Doll and the Mango Tiki Wiki Doll are both super cute! 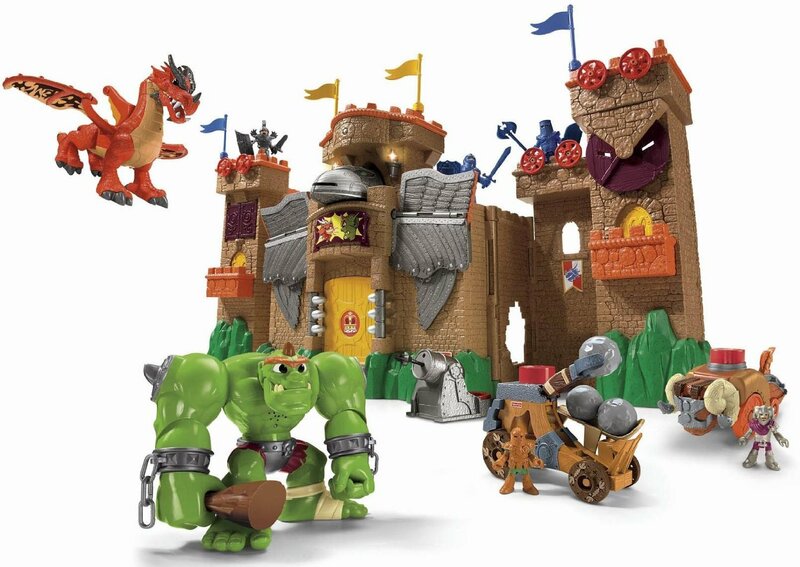 The Fisher-Price Imaginext Eagle Talon Castle is a super fun interactive castle for boys aged 3-8. Have a little rebel on your hands? Kid’s these days are obsessed with funky hairstyles and expressing themselves. 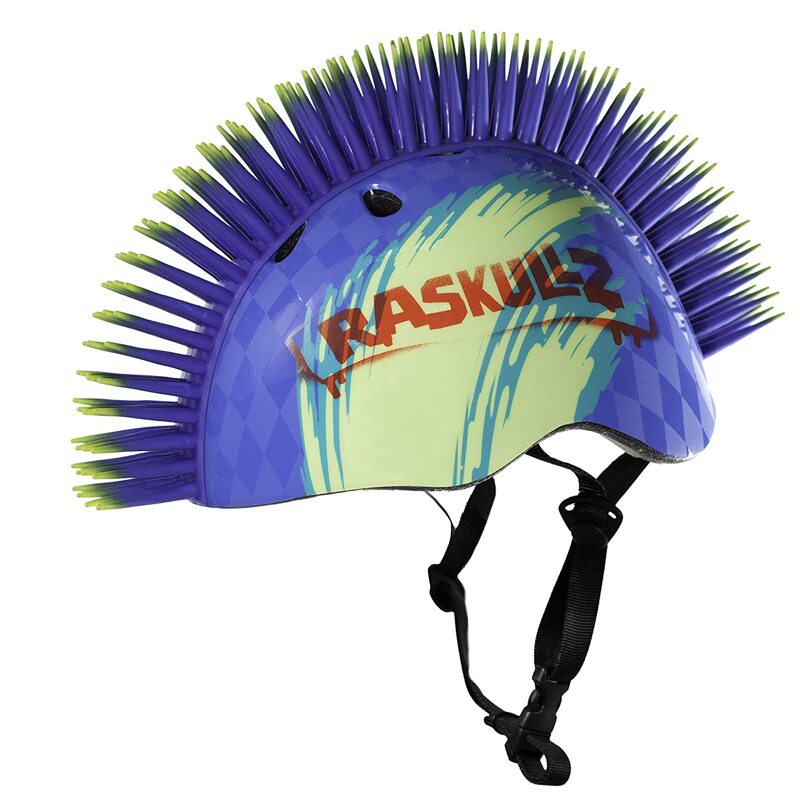 These Raskullz Hawk Helmet s are so fun and wild, even the most reluctant helmet wearer will be wanting to try it out! 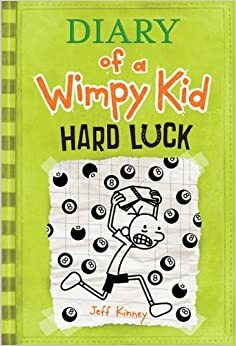 How about the newest book from Diary of a Wimpy Kid; Diary of a Wimpy Kid: Hard Luck? 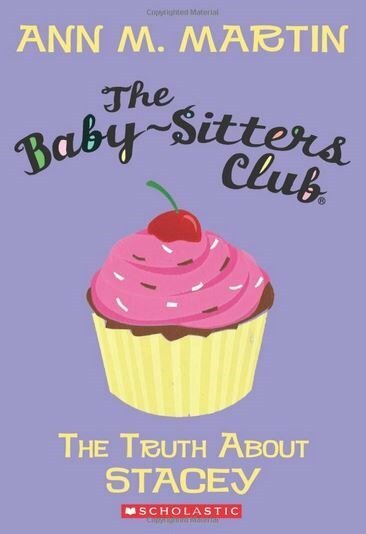 This book comes out in early November, but preorder now! Or, is your child down with the spooky Goosebumps series? 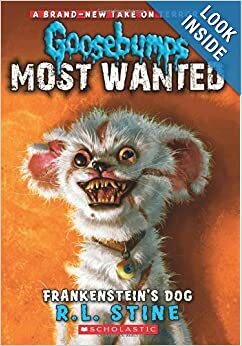 This Goosebumps Most Wanted #4: Frankenstein’s Dog looks sure to spook! Monster High Dolls are also super popular right now! The 13 Wishes Gigi Grant Doll and the Travel Scaris Skelita Calaveras Doll would be great additions to any collection! 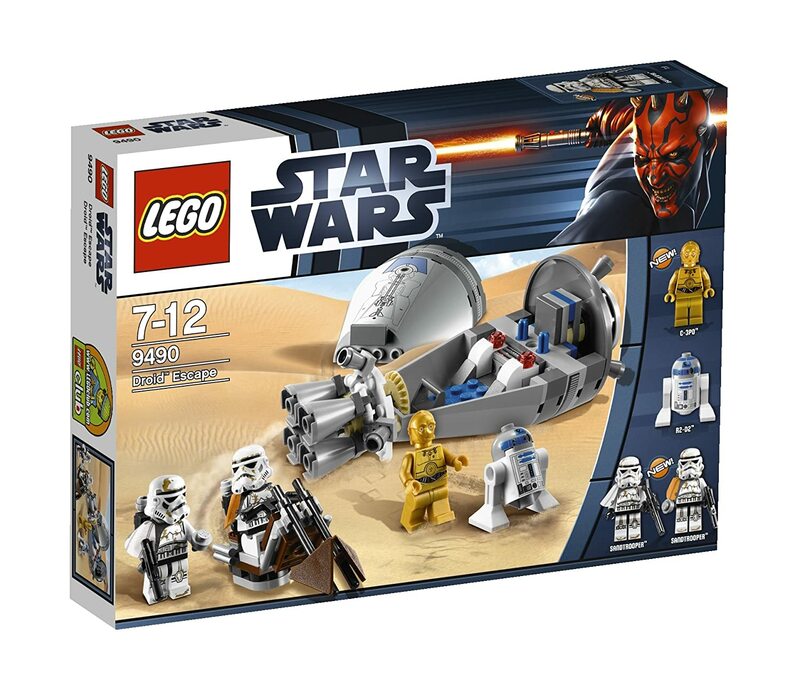 Star Wars Legos, what a genius idea! 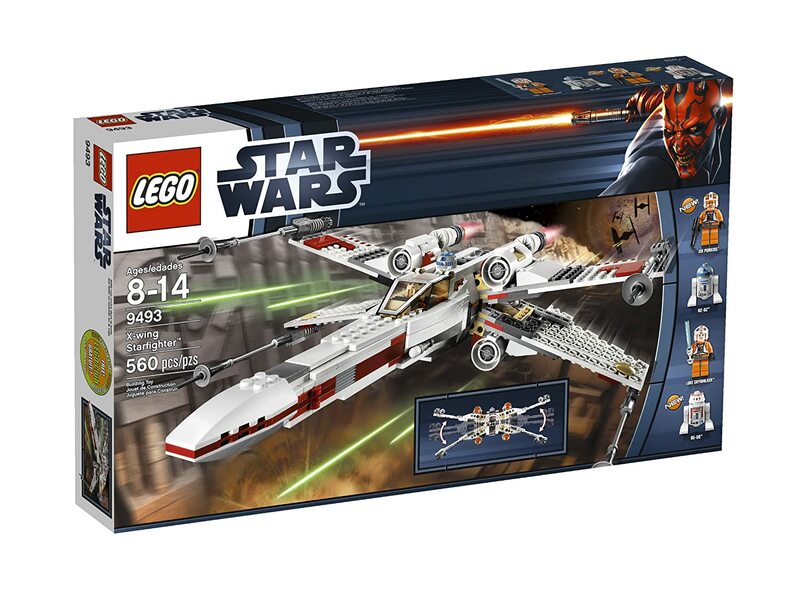 Check out the LEGO Star Wars X-Wing Starfighter and the LEGO Star Wars Droid Escape for 2 perfect gifts. Around this time girl’s catch the American Girl bug! Here are 4 Film Favorites: American Girl that the girls will go crazy over! 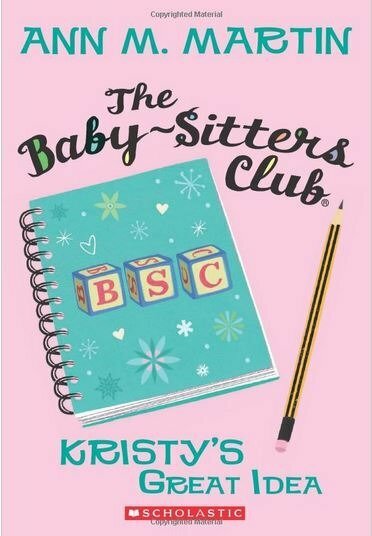 We love going outside on nice days, so maybe your child would like to take up a new hobby? Skate boarding can be really fun and definitely teaches a lot of coordination. 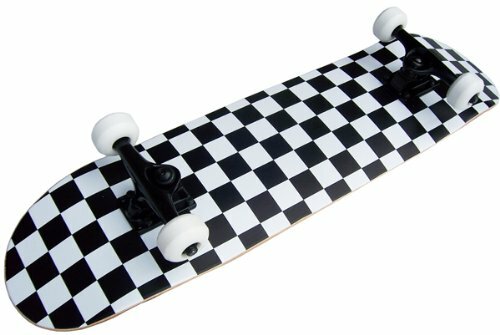 This checkered Skateboard is gender neutral. We are living in a time when technology is king and kid’s love having a hand in that. 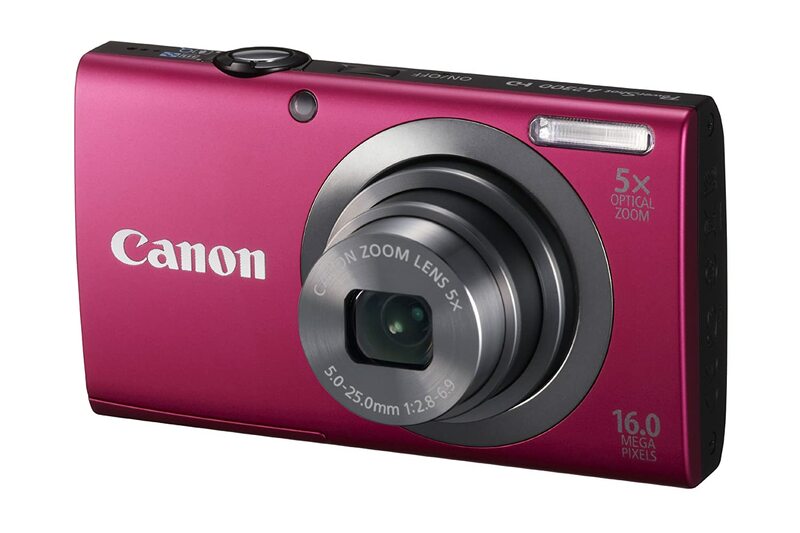 Expand their artist talents with a Canon PowerShot Digital Camera ! 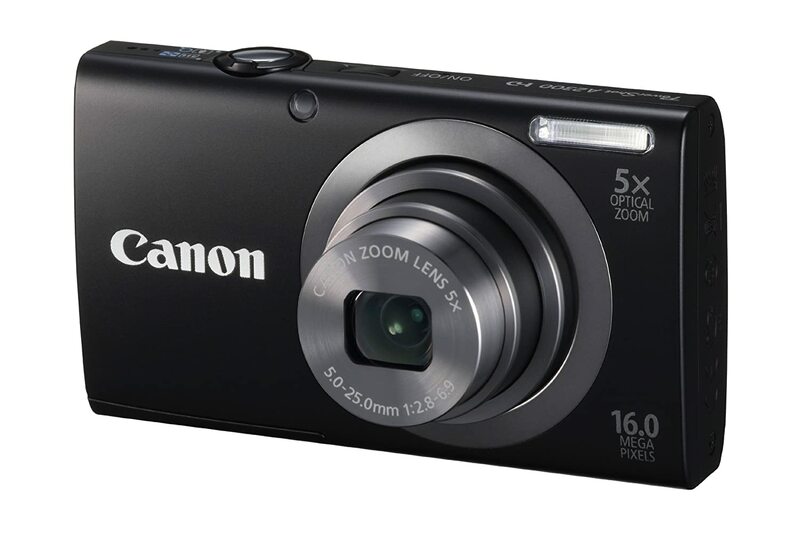 This camera has all the bells and whistles (including HD video recording), and doesn’t break the bank at $89. 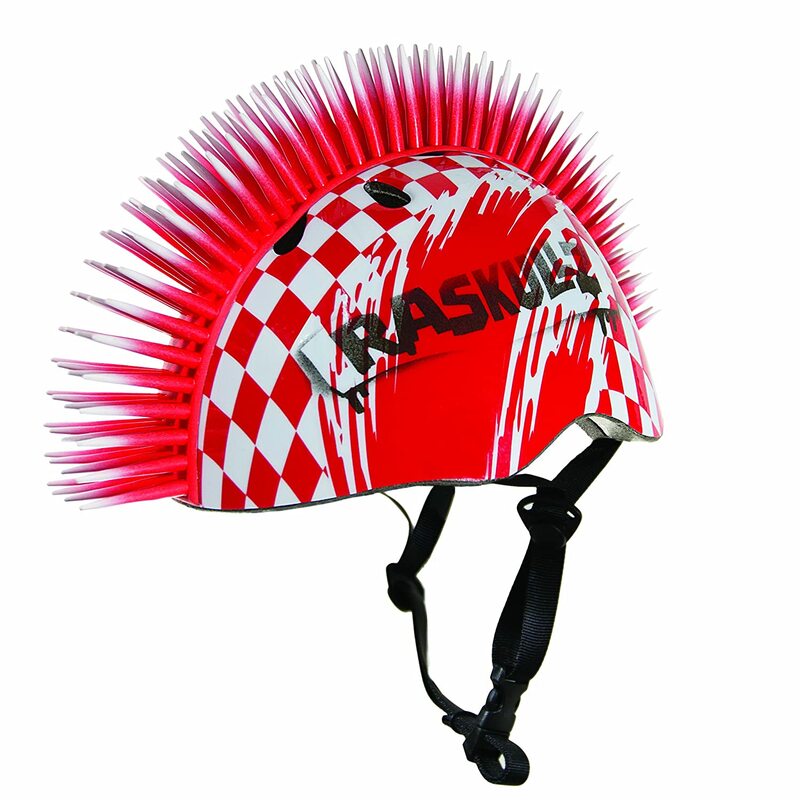 It also comes in 4 different colors (red, black, silver, and blue). Everyone loves Despicable Me! 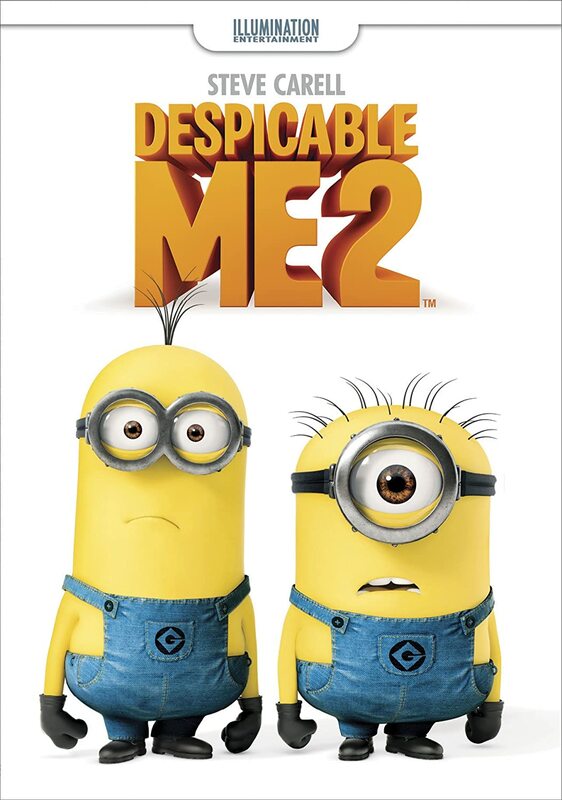 Pre-order Despicable Me 2 now, and it will be delivered to your door on December 10th, just in time to wrap for Christmas! That’s it for today! Stay tuned for the next posts in this Holiday Shopping Guide Series (Teenagers, College Students & 20-something’s, Significant Others, and Parents & Grandparents)! 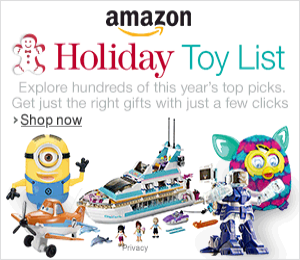 Check out Amazon’s Holiday Toy List for more inspiration as well! And if for some reason you STILL haven’t signed up for a free trial of Amazon Prime (hello free shipping! ), click here and do it now! This is an awesome list! 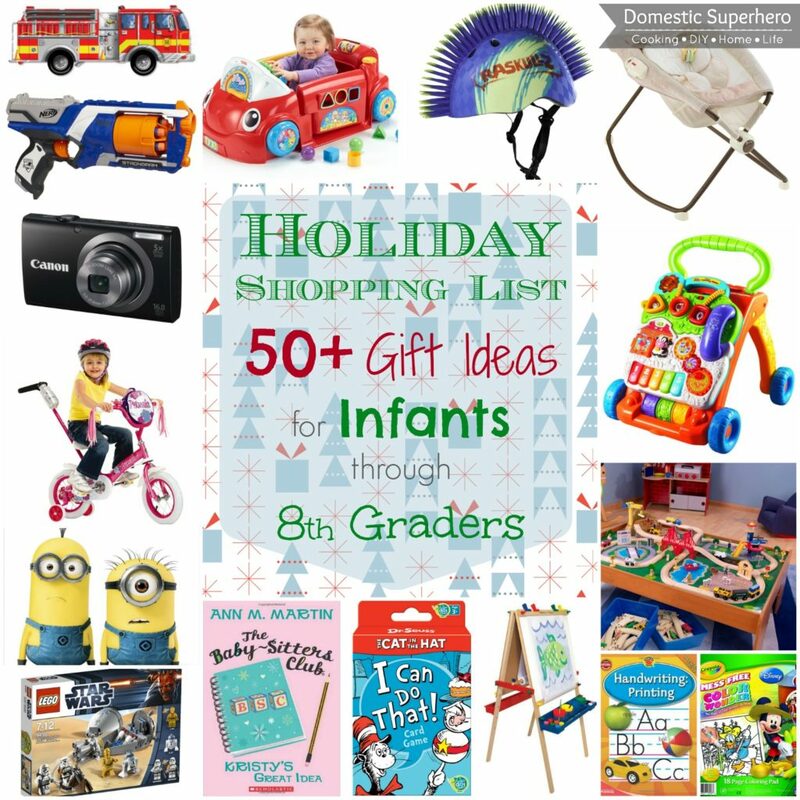 Great job putting it all together – definitely got a few ideas for my daughter for Christmas. Thanks! Pinned and shared! Thanks, Kirsten, and thanks for your help! 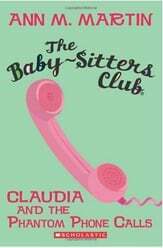 Stay tuned for the next installments in this series! What a great list! 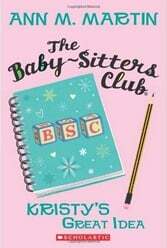 I’ve seen several things for my 3 year old and my infant daughter that will be great for Christmas. Now I’m excited to start shopping. I will say that we got my son a train table last year for Christmas (from Santa) and it was so worth it. I like the one you showed here but we found that the Imaginarium brand at Toys R Us was great and has held up wonderfully and has lots of sounds and trains that come with it. Plus additional trains and stuff are really reasonably priced and always in stock at the store. Just wanted to share that. That a great tip April! I was actually thinking about buying that train table for my son, but I might look into the one you mentioned as well. I want to find something great that will last for a while! Thanks for stopping by and stay tuned for the next 4 posts about holiday shopping!